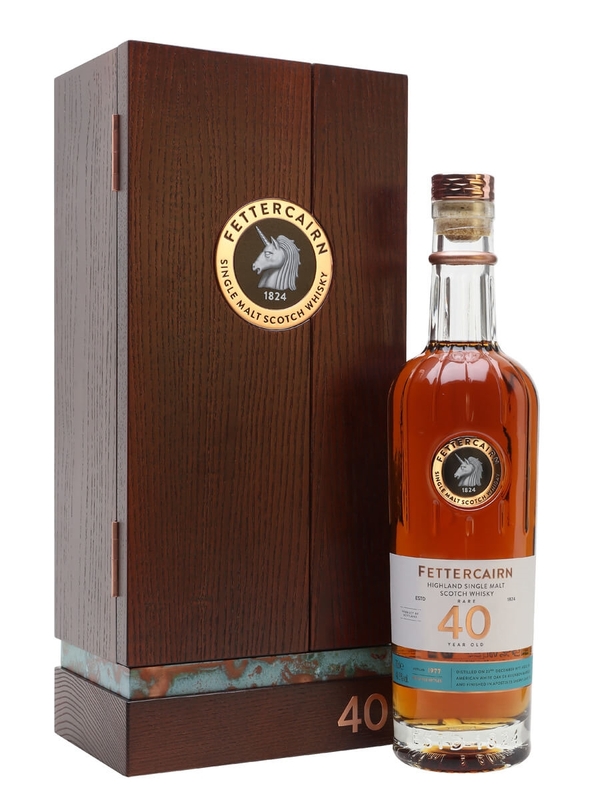 A very old whisky from Fettercairn, distilled on 23 December 1977 and laid down to mature for 40 years before bottling in 2018. It spent the final few years in Gonzales Byass Apostoles palo cortado sherry cask, adding layers of dark fruit, citrus and toffee to the elegantly fruity whisky. The result is a complex balance of fresh fruit and sherry cask character, with a touch of balsamic sweetness. Distilled on 23rd December 1977 and laid to rest in American White Oak ex-bourbon barrels with a finish in an Apostoles Sherry Cask No.6 for a truly dark and intense whisky with dazzling amber highlights. On first nose, honey, molasses, and ginger, then overtaken by toffee apple, thick treacle, and sherry. To taste liquorice and balsamic vinegar, are balanced with citrus, toffee and raisin for a glorious finish of soft spice and tropical fruits. This forty-year old expression is non chill-filtered with no added colour.